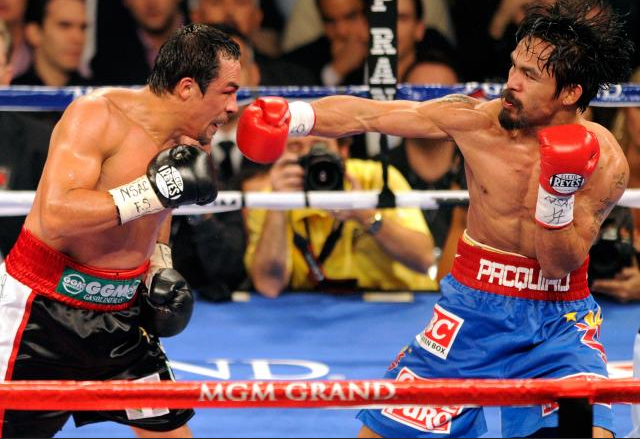 Manny Pacquiao was unconscious in the ring for almost 30 seconds when he was knocked down by Juan Manuel Marquez with a vicious right hand at the end of the sixth round Saturday night, putting a ferocious end to the fourth fight between the two boxers. Manny Pacquiao had been down in the third round but knocked Juan Manuel Marquez down in the fifth and the two were exchanging heavy blows in the sixth round before El Dinamita threw a right hand that flattened Pacman's face down on the canvas at 2:59 of the sixth round. 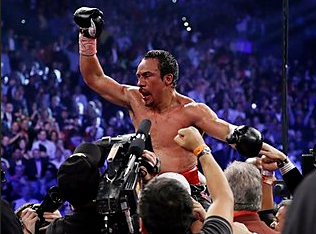 The referee waived the fight to an end as Juan Manuel Marquez celebrated and the sold-out crowd at the MGM erupted. 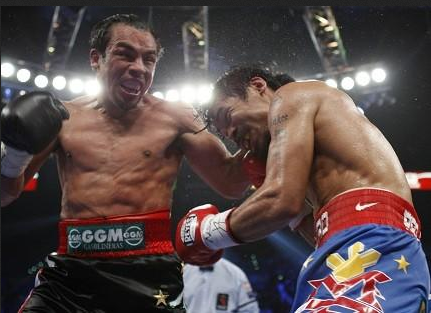 Manny Pacquiao was down for about two minutes before his handlers managed to get him up.